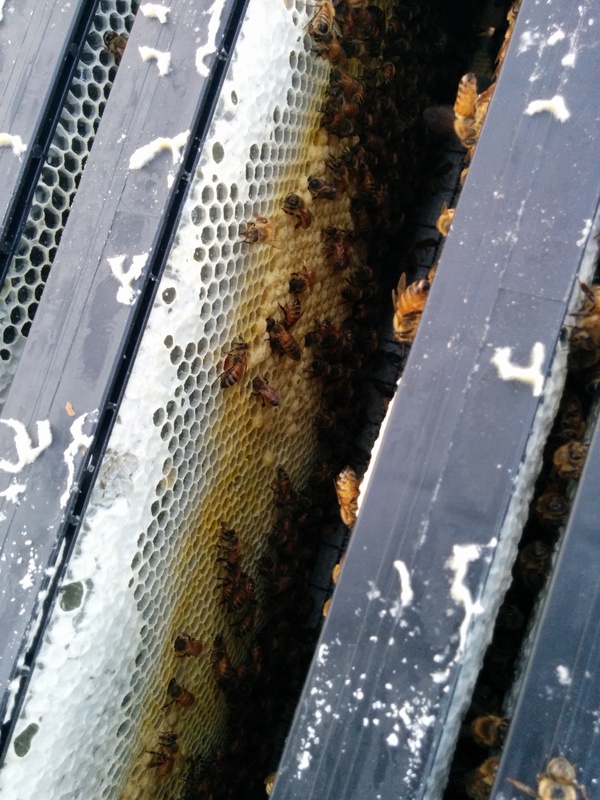 Upon opening the hives for the weekly inspection, I found a large chunk of comb extending up off of a frame into the feeder. It looked like the colony was brooding a queen, but the cell was incomplete and oozing honey which may have just been an abnormal section of comb. However they have not capped much comb, although many are filled with honey, and have not laid any eggs. The likely answer is that the queen died or left the hive not to return. Unfortunately my phone was dead or I would have taken pictures. I should have found a way to do so anyway. Regardless, I will call the [semi]local beekeeping shop tomorrow. I intentionally waited to publish this post so I could consult my beekeeping books and get to the root of the problem. Considering the location of the comb, it is likely just something called “Burr Comb” where the bees build comb in any vacant space. In this instance, the suspended queen cage left an open space where they likely started building rogue comb. I wanted to get back into the hive an make sure the queen is alive, but it rained the entire week! Rain means grumpy bees. For the 90 second drive back to the main farm, I plugged my phone into the car charger to take pictures of the other hive as I feared the worst. My fears were alleviated once I opened the hive. The bees might have been pissed off, but the frames were filling with comb. In fact, the centermost frame had a nice radial circle of capped and egg filled comb.